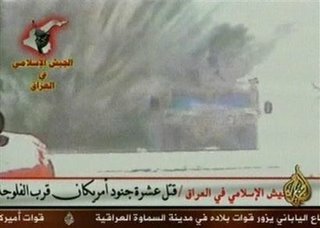 Aljazeera was caught red-handed in a bogus Anti-American story this weekend. The caption to this picture from the AP does not reflect what Al-Jazeera originally reported. FOX News broke the bogus story by Al Jazeera. The actual attack that killed 10 American soldiers on Thursday happened at night in a court yard and not in a humvee. The story is reminiscent of the bogus Newsweek story earlier in the year. Israel arrested an Al-Jazeera reporter this weekend in the West Bank. Aljazeera reported that Rajub, a Palestinian, was beaten up in the presence of his wife by the Israeli soldiers. His computer and mobile phone were also confiscated. The Jawa Report is saying that it was FOX News who broke this story and adds that the incident happened in a courtyard and not in a humvee. The Reality Show is upset with those groups excusing the terrorists. Of course, as Athena notes, this is not the first time that Aljazeera has been wrong.